My husband Steve and I began raising puppies for the Southwest Regional office of Canine Companions for Independence at the beginning of 2005. 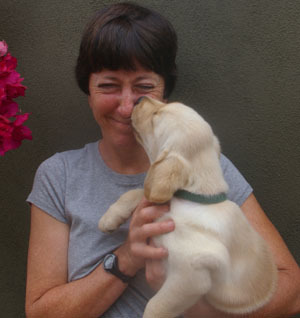 Our first puppy, Tucker, was released from advanced training for excess “distractibility” in 2006, as was Yuli in 2008. Our third charge, Brando, graduated in August of 2011, and was placed with a wonderful family on the south side of Chicago. Our fourth CCI puppy, Darby, was released for excessive barking, and our fifth, Dionne, was judged to be too energetic for life as a service dog. Undeterred, we have been matched with Puppy #6 — a labrador/golden cross named Kyndall. Wonderful people raising wonderful dogs for a wonderful cause:) Keep up the good work! Love you guys.